A huge fossilised skull of the possibly largest marine reptile that ever lived has been discovered along Britain's Jurassic Coast. 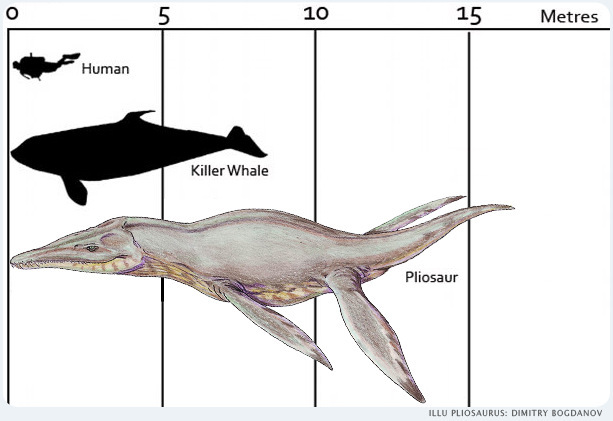 Up to 16 meters body length and 12 tons heavy: the remains found by fossil hunter Kevan Sheehan belong to colossal swimming predator, called pliosaur. The marine reptiles dominated the seas at the same time as dinosaurs populated the land, around 150 million years ago. Now paleontologists reported at Weymouth Bay on the south coast of England the discovery of potentially the largest pliosaur yet found. The fossil had a skull length of 2.4 m. It is simply enormous." Dr David Martill, a palaeontologist from the University of Portsmouth, said: "This is one of the largest, if not the largest, pliosaur skull found anywhere in the world and contains features that have not been seen before. "It could be a species new to science." Palaeontologist Richard Forrest told the BBC: "I had heard rumours that something big was turning up. But seeing this thing in the flesh, so to speak, is just jaw dropping. The skull, which is said to be 90% complete, shows a predator with a huge powerful jaw lined with large razor-sharp teeth, similar to a crocodile's. Using four paddle-like extremities to glide through the water, pliosaurs would have hunted ichthyosaurs - huge reptiles which resembled modern-day dolphins and other marine species. Dr Martill said: "This creatures had massive big muscles on their necks, and you would have imagined that they would bite into the animal and get a good grip, and then they probably would have thrashed the animals around and torn chunks off. The exact location where the fossile was found by Kevin Sheenan is only knewn by local authorities to avoid souvenir hunters on the Jurassic Coast, Britain's only Unesco World Heritage Site, which runs along 95 miles of the Devon and Dorset coastline. Richard Edmonds, earth science manager for the Jurassic Coast World Heritage Site, said: "Kevin has done a fantastic job, rescuing this huge fossil over several years. 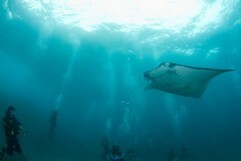 Without his efforts,the specimen would have been lost to the sea." The monster find has been secured with funding from the Heritage Lottery Fund, plus Dorset and Devon county councils, and will be prepared for permanent display at the Dorset County Museum in Dorchester. More information is available at the Jurassic Coast World Heritage Site. View the BBC online coverage.